Germinal epithelium of the testicle. 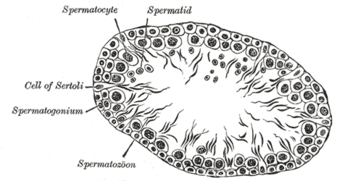 Transverse section of a tubule of the testis of a rat. × 250. 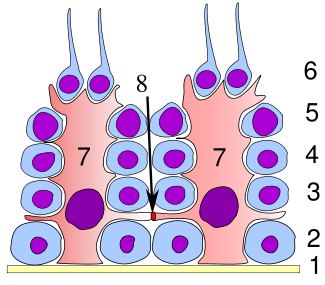 Scheme showing analogies in the process of maturation of the ovum and the development of the Genyo spermatids (young spermatozoa). ↑ Cyranoski, David (25 February 2016). "Researchers claim to have made artificial mouse sperm in a dish". Nature. doi:10.1038/nature.2016.19453. Retrieved 4 March 2016. Histology image: 17804loa – Histology Learning System at Boston University - "Male Reproductive System: testis, early spermatids"
Histology image: 17805loa – Histology Learning System at Boston University - "Male Reproductive System: testis, late spermatids"